A Synthetic Turf Sand Infill Porosity Assessment has been carried out recently to a dozen all weather sports pitches because they seemed to be holding water. An all weather pitch is designed to soak up rainwater through very quickly. The sand infill is porous and if it is a 3G pitch the rubber infill product is also. Facilities with this type of surfacing are becoming more common throughout the UK as many schools and leisure centres have them installed to replace natural grass. For a lot of sports, the artificial flooring can provide a more sustainable and long lasting alternative. However recently it has become more apparent and common for the porosity to slow down. This leads to a build up of water on the surface as it can’t drain away, when this happens it can make the pitch unsafe for use. We took testing out on this to find out why this was happening. We found some interesting results throughout our assessments of these sand filled pitches. An investigation of water retention to the sports surfacing sand infill was carried out. 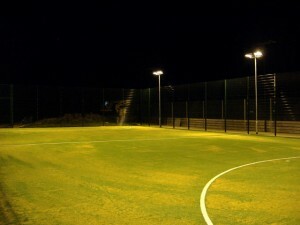 The size of sand infill in these pitches is generally designed and specified to be between 0.2mm and 0.8mm diameter and this combination has been tested to be porous. However quarries have started to send these sand specifications out on some occasions to have much more 0.2mm grade sand than the higher bracket of 0.8mm. Does this still meet the specification? – Yes it does because is in the parameters. But having more smaller sized sand particles starts to slow porosity down. This is because the tiny grains of sand fill in any small gaps which should be left open for water to drain through. When porosity is slowed down, the surface of the pitch becomes damp and is a perfect breeding ground for moss and dirt. The dirt then mixed with this fine particle sand starts to clog up and become even less porous. This can become a serious issue and we have heard of sports pitches needing to have the infill replaced even quite soon after the initial installation. This is not part of infill rejuvenation maintenance that is usually suggest after six years but mainly due to the fact of the sand particle size causing reduced permeability. I will come back to the question: Is this sand infill within the parameters that the manufacturers of the synthetic turf suggest? The answer is yes it is, however I feel this needs addressing personally because if they just delivered 0.2mm – 0.3mm sand then this would not be ideal for a sports pitch infill. However this does fall within the specification and ideally it is this mix of smaller and larger sand particles which help the porosity. The investigation reports we had were in accordance with BS EN 911-1 for geometrical properties of aggregates and particle size distribution. The porosity testing was in accordance with BS EN 12616 for determination of water infiltration rate to surfaces for sports areas. When you order your standard silica sand infill, if there is a higher percentage of the fine range then this slows down lateral movement (due to smaller than optimal size of the sand) and slows porosity within the system. Should this therefore mean the sand specification set out by carpet manufacturers or governing bodies should change this. Maybe creating this to a minimum fine range size of 0.3mm or highlighting to the quarries that less than 25% needs to be of the fine range specification. Something certainly needs sorting on this to prevent further synthetic sports pitches having any standing water because you really want the surface at its fastest rate for porosity as possible. This is the all weather pitches greatest attribute that even in heavy rain the surfaces are perfect to play on. If anyone agrees or disagrees with this that please tweet me on @james_dooley and lets discuss the matter because i feel something needs to be highlighted of this within the testing or specification designs of the surfacing. The Synthetic Turf Sand Infill Porosity Assessment is a very important assessment in the pitches. Please get in touch with us through the contact form on this page to find out more on these services and what can be done to look after your pitch.